wodesorel wrote: Sunshine started fussing and refusing food right before she was ready to molt. She also kept spinning herself around and knocking herself onto her back. At that point I covered her with a cocohut and left her alone for one week. I did water and food then - just in case - and she refused both so I left her alone for another week and peaked in just to check, she had shed! I then treated her like any other crab and allowed her to molt unaided and dig out of the cocohut on her own. I will check on him until I leave for Chicago next week. I put him in molting mode today. He has leg buds so its probably time for him to get to molting because another person told me who's gone through this, that's its about 2 weeks after they sprout jelly legs that they go molt and its about that time Good luck my clyde we are rooting for you. we are Back from Chicago. That's not normal!! There is no such thing as a partial molt with crustaceans, the entire skin comes off as one complete piece all at once. If their exo starts flaking off in chunks they do not survive. What exactly did you see? Can you get a picture? wodesorel wrote: That's not normal!! There is no such thing as a partial molt with crustaceans, the entire skin comes off as one complete piece all at once. If their exo starts flaking off in chunks they do not survive. I'm actually impressed how well all his new legs look in such a short time. In the process or healing or not, I agree that a partial shed is not normal. They have to shed their entire exo to have a successful molt. Gel legs are a good sign, but that crab is not out of the woods yet. The situation is more common than you would think, as crabs are competitive over resources naturally. If you search the forum for shell jacking I'm sure you'll find several threads similar to yours. Please try to not pick him up unless necessary, especially after a molt because they can still be soft. Also, he should only be eating his exo until he no longer wants it after a fresh molt. It does take a couple molts for them to get completely better. At the end of the day, it is your crab, but I guarantee that you are in the best possible hands with Wode's advice. Wishing you and your crabbie the best! If he has retained exo on the two legs that were still whole things may still go downhill so be prepared. Best case scenario is that he drops those two limbs soon, this is why they can! 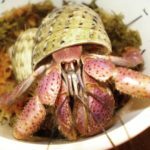 I have never known a crab to be able to shed retained exo during the next molt. He probably was not able to wiggle those legs free this time around either due to injury or just physical limitations. Ok I understand that. But the 2 legs left were his big pincer that was crushed in first fight and one walking leg. He has to be completely cared for. I'm not even sure he can eat his exo skeleton with no way to pick it up before we left for vacation I set him up almost like a forced surface molt and until I woke him up last night out of concern after reading comments, he seemed in the process so maybe he's not finished but the rest of his body was there shedded except the 2 legs he had left maybe he could not wiggle them out. Maybe they are shedding and stuck on but I won't touch him right now again but he did seem to be fine and progressing in his healing. I will keep checking on him and keep updating. wodesorel wrote: If he has retained exo on the two legs that were still whole things may still go downhill so be prepared. Best case scenario is that he drops those two limbs soon, this is why they can! I have never known a crab to be able to shed retained exo during the next molt. He probably was not able to wiggle those legs free this time around either due to injury or just physical limitations. Also. P.S. Bonnie that took his shell is down molting as we speak she's been down over 2 weeks I'm sure she's gonna be down a while more probably some time in July. He sounds like he is done molting at this point. They spend a long time looking for the right spot and recovering energy after, but the actual shedding process takes a few minutes to a few hours at most. They pop right out of their old skin with it in one solid piece, and then chow down on it which can take a few days to a few weeks, and they can do so with only their mouthparts if necessary. Surface molters can be done with the whole process in a week, though they may end up weakened for a few weeks after. When they aren't able to get that whole skin off in one piece it will not come off at a later time. When they molt they pull back fluids from the front half of their body and they physically separate new skin from old skin so they have space to wriggle free. They do not have the ability to control that process in a single area, it is all or nothing. And given that the new skin has now hardened into a normal exo while trapped under the old dead exo, there is a huge chance for constriction of the tissue which can cause parts of the limb to die or become infected if everything is too tight. There also isn't much space in those limbs for a normal molt in the future, especially at the joints. There is always a chancs his next molt is normal, but you'll have to wait and see! Clyde is still alive he dropped the front part of his long walking leg. I continue to feed and water him every other day. 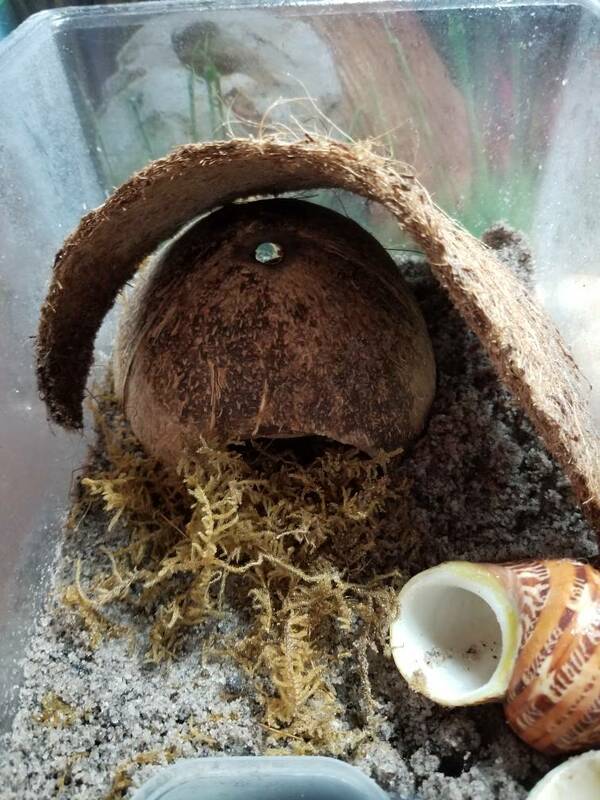 He just stays under his coconut cave I leave him out for a while when I feed and water him. He has a will to live.